Shoveling and Drilling for Blast, western Pennsylvania, circa 1910. 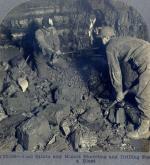 Miners preparing for entry into a bituminous mine, southwestern PA, circa 1910. Pat Fagan, UMW District 5 leader, addressing gathering of miners in the mid-1930s. 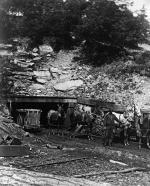 A miner and his mules at a Coal Mine Entrance. The H.C. Frick Coal and Coke Corporation's Edenborn Mine after shooting of 12 coal strikers, outside Brownsville, PA., November, 1941. A Miner Reacts to a Newspaper Headline, Coverdale, Pa., April 19, 1948. 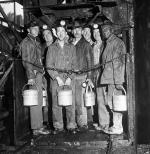 Coal miners test the air quality in the mine.